“After our problems last time out at Donington I was pleased to come away from Brands Hatch having completed both races and with some good points on the board. 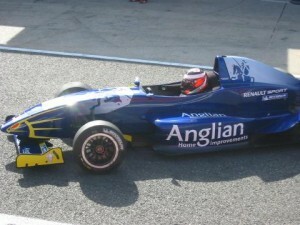 I started Race One on Sunday from the back of the grid, having made a mistake in the first qualifying session. It was important to make a good get away and look to move up a couple of places early on because we knew from our lap times over the weekend I was quicker than a few guys in front of me. I managed to get a good start, immediately pulling right up alongside the car ahead of me but I then had to hit the brakes hard as another car ahead of us on the grid has stalled. I still managed to make up a few places as we came out of the first corner at Paddock Hill and spent the first part of the race on the tail of the guy in front. I chased him hard for several laps and must admit I got a bit frustrated as he kept weaving from side to side every time I tried to make a move. Eventually, I tried to force my way through coming out of the Surtees chicane and overcooked it a bit, spinning in the process. I managed to keep the car going and returned to the track to complete the 25 laps and pick up my first points of the season. Race Two went a lot better and more to plan. Having qualified 15th, with only hundredths of a second splitting me and two other cars, it was always going to be close. Again I made a good start off the line and found myself up in 13th by the end of the first lap. After six or seven laps of close racing with the car behind me, I ran a little wide coming out of Graham Hill and he slipped past. However after that I managed to put in some consistent lap times and finished the race in 14th place, which we were pleased with on my first visit to the track. Anglian Home Improvements formally known as Anglian Windows. Supporting people’s development since 1966.